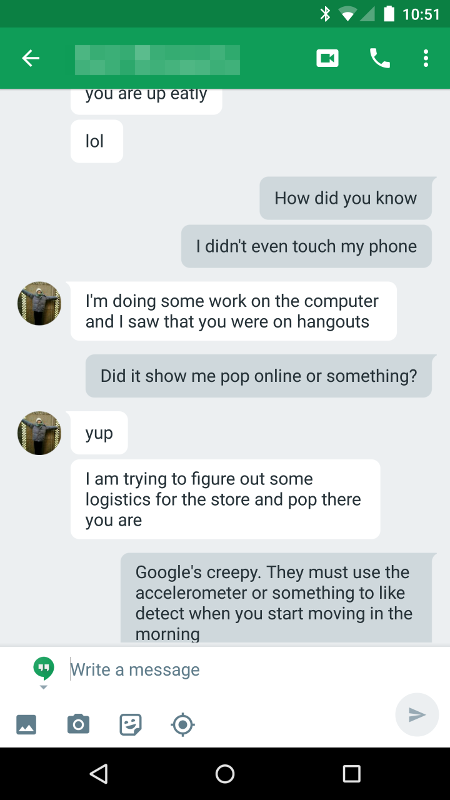 My theory is that Google Hangouts uses the accelerometer on my phone to detect when I start moving in the morning so it knows I woke up, and then it sets my status to Online. I saw similar stuff happen with Facebook Messenger a long time ago too when I used that app... but that's Facebook and it's safe to assume they're always doing creepy stuff like that. Googling this kind of stuff doesn't turn up many results. But now there's this blog post for anyone else who looks into this. It's happened too many times to be a coincidence; why would my status change to Online at just the same time that I happened to wake up and roll over in bed? That is certainly a possibility, and given how trivial it would be to implement, it wouldn't surprise me at all. On HTC devices (and perhaps others) what may be a related setting is exposed in Settings > Power > Sleep Mode. What you're seeing may simply be your data connection reconnecting each morning, but I doubt it. If you've never done it before, I heartily recommend downloading your location history from Google's Privacy page. They are evidently using the accelerometer to augment the location data, as they don't just know where you've been but also how you got there (e.g., walking, driving, etc). My phone is the Nexus 6 so it doesn't have sleep mode settings like that. By "not touching my phone" I mean my phone was sitting on the table next to my bed and I didn't touch it. With the accelerometer thing, I'd suspect that it's when I get out of bed and walk by the table the phone could detect the vibrations and realize I'm awake and sign me into things. There are apps designed for monitoring your sleeping habits where you'd set your phone on your pillow and it can figure out when you drift off into REM sleep or when you're tossing and turning or whatever, all by using subtle readings from the accelerometer. I'm fixing to start writing a chatbot for Google Hangouts and when I do I'll program it to log my online status and get to the bottom of this mystery. My phone just gave me a notification that says, it seems you wake up at 341 a.m., would you like to set an alarm? It happens with my phone too. Haven't touched it, but after about 1 minute of getting up, it starts sending notifications. Regardless of the time.